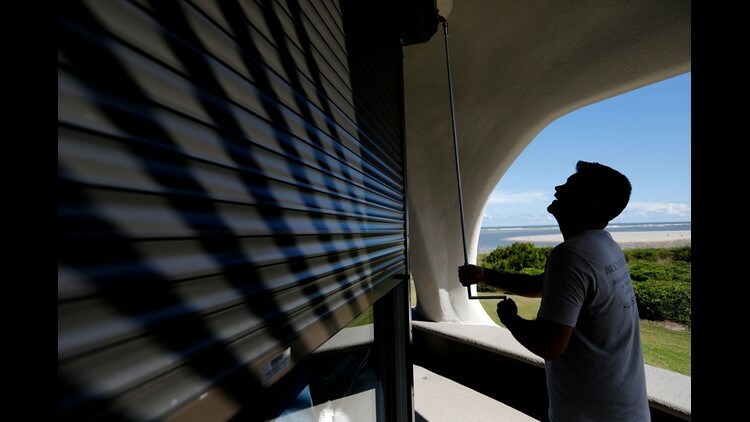 Chris Brace, from Charleston, S.C. lowers hurricane shutters on a client's house in preparation for Hurricane Florence at Sullivan's Island, S.C., Monday, Sept. 10, 2018. Brace said that after S.C. Gov. Henry McMaster ordered an evacuation the property owner asked for the house to be boarded up. With Hurricane Florence spinning through the Atlantic Ocean and threatening to slam into South Carolina later this week, Gov. Henry McMaster ordered mandatory evacuations for the state’s entire coastline beginning at noon Tuesday. All lanes on multiple roadways will lead to safety, too. The Palmetto State, for the third straight storm season, will reserve lanes on multiple major highways – including Interstate 26 between Charleston and Columbia – to push all vehicle traffic away from an approaching hurricane that could be poised to become the southeastern United States’ next Hurricane Hugo. “We are not going to gamble with the lives of the people of South Carolina,” McMaster said. While evacuation orders are issued by states as a protective action in disaster events such as hurricanes and wildfires, they are sometimes ignored by people – whether it’s because they didn’t believe the warnings, didn’t have the financial means or refused to abandon friends, family or pets. In January, 17 people were killed in flash flooding and mudslides in Southern California, some of whom didn't heed voluntary evacuation orders, The Associated Press reported. One woman whose parents were killed told the Chicago Tribune they decided against evacuating their "forever home." Six months later, the Carr Fire in northern California near Redding killed six people (and two firefighters), with law enforcement authorities blaming one death on the failure to heed evacuation orders, CBS News reported. Some 7 million people, primarily in Florida, were asked to flee from Hurricane Irma last September, the largest mass evacuation in U.S. history, easily surpassing the 2.5 million who were ordered to evacuate during Hurricane Matthew in October 2016. It’s unknown how many of those millions decided instead to hunker down. As that storm pounded the Sunshine State, CNN talked to four locals in the Florida Keys who didn't heed warnings, with one saying, "I'm prepared for the worst but hoping for the best," and MSNBC's live on-site weather report from Miami Beach was interrupted by a kite surfer riding hurricane-charged waves. As of Tuesday, Florence was driving sustained winds up to 140 mph. The storm, which intensified from the Category 1 to a Category 4 in a mere 13 hours on Monday, is tracking to make landfall Thursday night or Friday morning. There are mandatory evacuations set for Virginia, too, where Gov. Ralph Northam has ordered about 245,000 people in flood-prone coastal areas to get out beginning at 8 a.m. Tuesday. It’s unlikely everybody will heed the warnings. Those who don’t won’t face punishment, either, and that could be another reason behind peoples’ decisions to weather a storm – no matter how dangerous. Only three states have laws in place to enforce mandatory evacuations – California, New York and North Carolina, with violators facing misdemeanor charges. The California Emergency Services Act also includes possibilities of a fine up to $1,000 or imprisonment for up to six months.